We have been sending out so many baby gifts lately and I love it! Clearly we are firm believers in placing scripture all around us as reminders of God's love as that is what our whole company mission is based off. Putting scripture and surrounding our kids in His Word is no different! We love that you see this too and are using us as gift ideas. 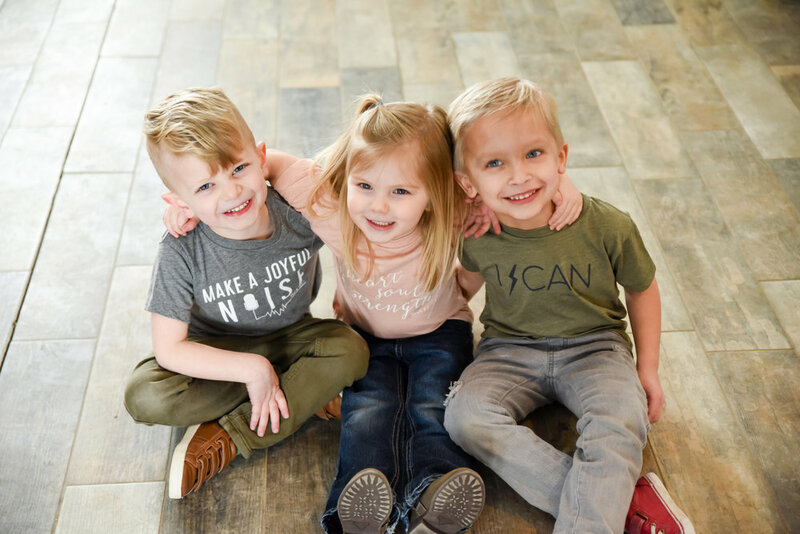 We offer a few pieces we absolutely love but we wanted to put together a little guide of other items for you and feature some of our other favorite mama shops and items that are scripture based and have the same mission. These items make for fantastic shower gifts, to welcome-a-new-baby-into-this-world gifts, baby dedication, baptism, or first birthday gifts. Or if you're like me, I love to give gifts to my kids any random day, especially gifts like these that have meaning. 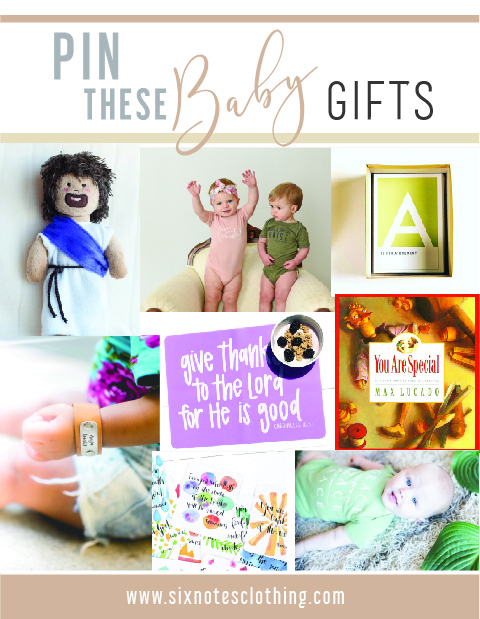 Below are some of our favorite scripture gift ideas for new babies and kids. Of course I had to include ours and mention it briefly... because how could I not! I LOVE our apparel items. Seriously... I do. I wish I could fit into one of those onesies. They are so soft! 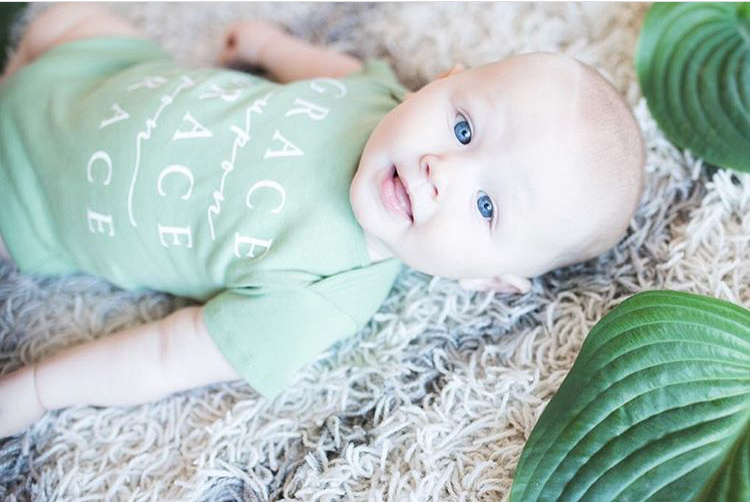 Our peach Heart, Soul and Strength (Deut 6:5) and olive Make a Joyful Noise (Psalm 100:1) onesies are a perfect baby gift! Each verse was chosen for a particular reason and you can read about them in their item description. The styles were chosen because they quite simply are our favorite. Soft and slim. It fits those baby bellies perfectly. and don't forget about our toddler and youth sizes! Elora Inspired is one of our absolutely favorite mama shops. They've become one of our instagram favorites. This year she added placemats with a mission. 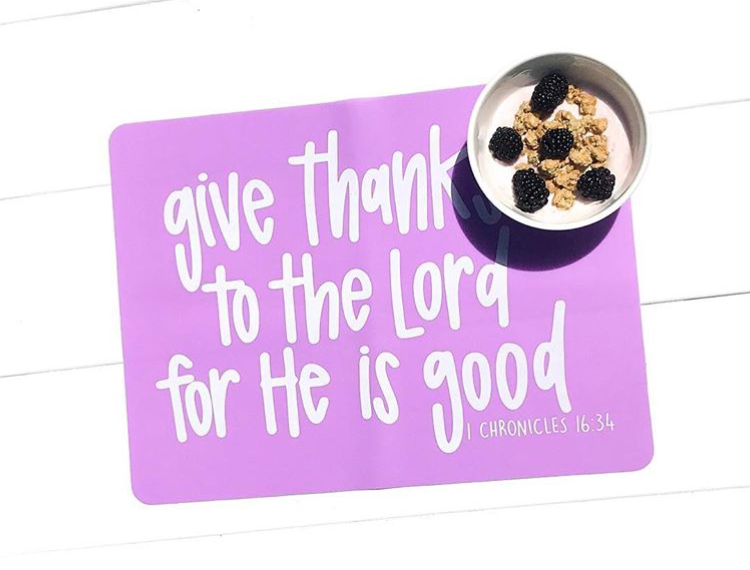 With each purchase of her scripture placemats she donates 32 meals to a local organization that feeds the hungry. She has many verses and colors available. You can also find kid's clothes, hats, and pillows. Filling their brains at a young age with scripture is so important. It will stay with them as they grow and come against those hard challenges in life. Crew and Co does such an amazing job at creating fun scripture cards to look at and work on with your kids. They have so many collections and make for fun Holiday gifts as well. This mama shop sells the absolute cutest leather cuffs for kids. (she also sells amazing jewelry for all ages... hint, hint) But I adore her cuffs. Many will use the cuffs to stamp their children's names on it. I, however, love the idea of stamping scripture on it. Just a simple verse like >> Fearfully and wonderfully Made or my favorite, Make a Joyful Noise. Or maybe we need to put a reminder for us on that little wrist as we guide them through life that says, "Be Humble, Be Gentle, Be Patient." Ephesians 4:2. My anthem as a Mom. Can I just get an Amen for these scripture cards? I can not get enough of them. In fact, I bought a couple pairs for myself and haven't even given them to my kids yet... you know... because I want them. Tiny Theologians offers the ABC's of cards whether based off the Names of God, Theological terms, or the Attributes of God. Each card has a small description on the back to read with your kids. 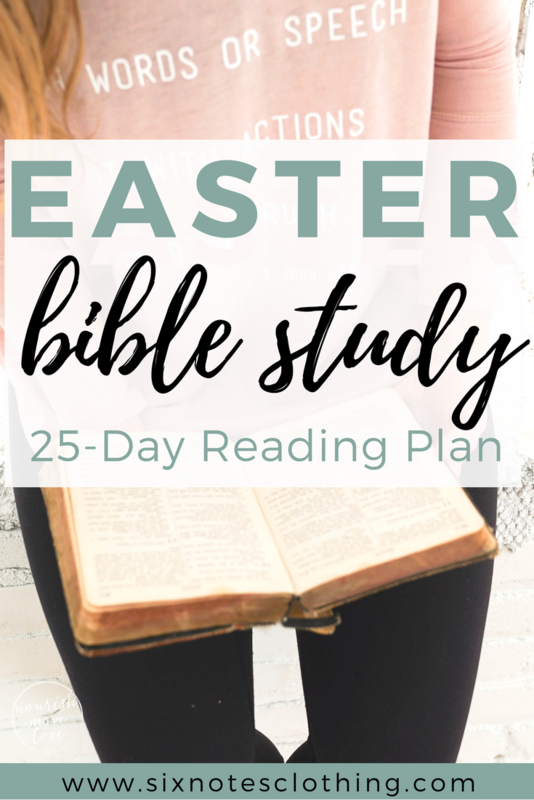 What a perfect little "bible study" to start your children on. They even have cards on women of faith! Forget my women's ministry studies... I'm doing this! Sooo... obviously not a little small shop company we have here. But seriously, if I ever have a baby shower that I'm asked to bring a book instead of a card to, these are it. I LOVE, LOVE these two books. In fact, if I ever get to pick out the books before bed time to read to my kids, I always pick out one of these. We've gotten a lot of Bibles throughout the years for the kids whether as gifts, through church, or VBS. Our church recommended this one a couple years back and it has been my absolute favorite. Every bible story points back to God and His plan for redemption through His Son Jesus Christ. Grace. Grace. Grace and more Grace. There is always a need for Grace in this world. Every single moment of every single day. We love this reminder from A Quiver Full. This Mama shop has a ton of items available for men, women, and kids but this is our fav. And we love this organic cotton green. Perfect for any sweet little babe. And... my son loves their dinosaur tee and I may need to get the Jesus, Grace and Dirt tee for this summer. To be honest, I think this company was sold. 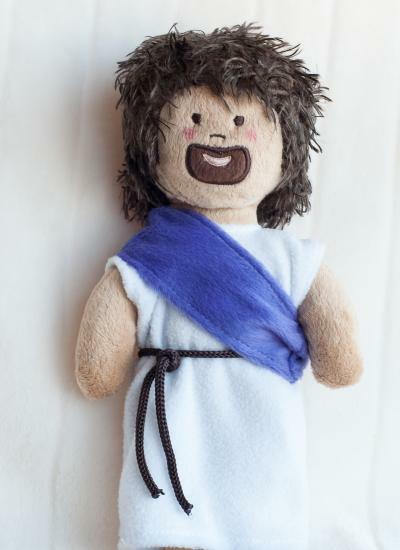 But it started with a mama right in our hometown just looking for a simple Jesus doll to help her child with nightmares. We received two dolls as a gift for my older two. They LOVED their dolls and it worked with their "bad dreams" as well. I find it absolutely precious that our children want to cuddle "Jesus" and find great comfort in that. So there you have it! Some new, fun, unique, creative and amazing gift ideas. AND ones that are centered around God's Word because God's Word is the best tool we could ever give anyone as the are either beginning their journey into parenthood or right in the thick of it.